Size: 19.5 x 4.5 cm Birch bark crafts came to us from the depths of centuries from our ancestors. In ancient times, boxes for food and drink storage were made of birch bark. Now there are not many such items in everyday life, but they have not l.. Size: 16 x 4.5 cm Birch bark crafts came to us from the depths of centuries from our ancestors. In ancient times, boxes for food and drink storage were made of birch bark. Now there are not many such items in everyday life, but they have not los.. 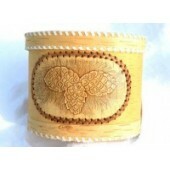 Size: 12.5 x 4.5 cm Birch bark crafts came to us from the depths of centuries from our ancestors. In ancient times, boxes for food and drink storage were made of birch bark. Now there are not many such items in everyday life, but they have not l.. Size: 19.5 x 4.5 cm Birch bark crafts came to us from the depths of centuries from our ancestors. In ancient times, boxes for food and drinks were made of birch bark. Now there are not many such items in everyday life, but they have not lost the..
Suit for adults. Birch bark crafts came to us from the depths of centuries from our ancestors. In ancient times, boxes for food and drinks were made of birch bark. Now there are not many such items in everyday life, but they have not lost their .. Size: 30 x 25 x 12.5 cm. The handle on the lid: 6 cm Birch bark crafts came to us from the depths of centuries from our ancestors. In ancient times, boxes for food and drinks were made of birch bark. Now there are not many such items in everyday l.. Size: 30 x 25.5 x 18.5 cm Note: The pictures on the box lid may be slightly different from the ones on the photos. Birch bark crafts came to us from the depths of centuries from our ancestors. In ancient times, boxes for food and drinks we..
Sizes: 15 x 15 x 12 cm Birch bark crafts came to us from the depths of centuries from our ancestors. In ancient times, boxes boxes for food and drinks were made of birch bark. Now there are not many such items in everyday life, but they hav.. Diameter: 6 cm, Height (with lid knob): 11 cm Birch bark crafts came to us from the depths of centuries from our ancestors. In ancient times, boxes for food and drinks were made of birch bark. Now there are not many such items in everyday li.. Diameter: 8 cm, Height (with lid knob): 15 cm "Bogatyr" stands for Hero in Russian folklore. The note Иван Чай means: Ivan-Chai Birch bark crafts came to us from the depths of centuries from our ancestors. In ancient times, boxes .. Diameter: 10.5 cm, Height (with lid knob): 14.5 cm Birch bark crafts came to us from the depths of centuries from our ancestors. In ancient times, boxes boxes for food and drinks were made of birch bark. Now there are not many such items in .. Diameter: 8 cm, Height (with lid knob): 15 cm Birch bark crafts came to us from the depths of centuries from our ancestors. In ancient times, boxes for food and drinks were made of birch bark. Now there are not many such items in everyday li.. Diameter: 13 cm, Height (with lid knob): 27.5 cm Birch bark crafts came to us from the depths of centuries from our ancestors. In ancient times, boxes for food and drinks were made of birch bark. Now there are not many such items in everyday.. Diameter: 10 cm, Height (with lid knob): 11 cm Birch bark crafts came to us from the depths of centuries from our ancestors. In ancient times, boxes for food and drinks were made of birch bark. Now there are not many such items in everyday l.. Diameter: 10 cm, Height (with lid knob): 15 cm Birch bark crafts came to us from the depths of centuries from our ancestors. In ancient times, boxes for food and drinks were made of birch bark. Now there are not many such items in everyday l.. Diameter: 6.5 cm, Height (with lid knob): 9 cm Good storage for salt, sugar, tea Birch bark crafts came to us from the depths of centuries from our ancestors. In ancient times, boxes for food and drinks were made of birch bark. Now there ar.. Diameter: 8 cm, Height (with lid knob): 10 cm Good storage for salt, sugar, tea Birch bark crafts came to us from the depths of centuries from our ancestors. In ancient times, boxes for food and drinks were made of birch bark. Now there are..
Birch bark crafts came to us from the depths of centuries from our ancestors. In ancient times, boxes for food and drinks were made of birch bark. Now there are not many such items in everyday life, but they have not lost their popularity and are&n..
Sizes: 13 x 9 x 6 cm Birch bark crafts came to us from the depths of centuries from our ancestors. In ancient times, boxes for food and drink storage were made of birch bark. Now there are not many such items in everyday life..